I am up for quite a challenge this time. I am not talking about getting up early in the morning, I am talking about the Blogging Marathon. I am all ready for the seven day blogging sprint – the menu is planned, cooking has been started, photos are being taken and write ups are being drafted. All that is left is, upload and publish. Now, that’s where I take the hit. The internet, my holy guru for everything, is pretty slow for the past some days. It will be slow till this month end, it seems. I have to wait forever for the pages and the pictures to load, which drives me crazy. So I don’t come near the laptop as much as I used to. I am sure I will start showing withdrawal symptoms in a while if this continues! Anyway, back to the event. Blogging Marathon is about seven continuous days of blogging, about the theme you have chosen from the list provided. I was born lazy and I plan to maintain it that way. So anything that makes my life easy, catches my attention fast. So I chose ‘Cooking with 5 ingredients or less’. 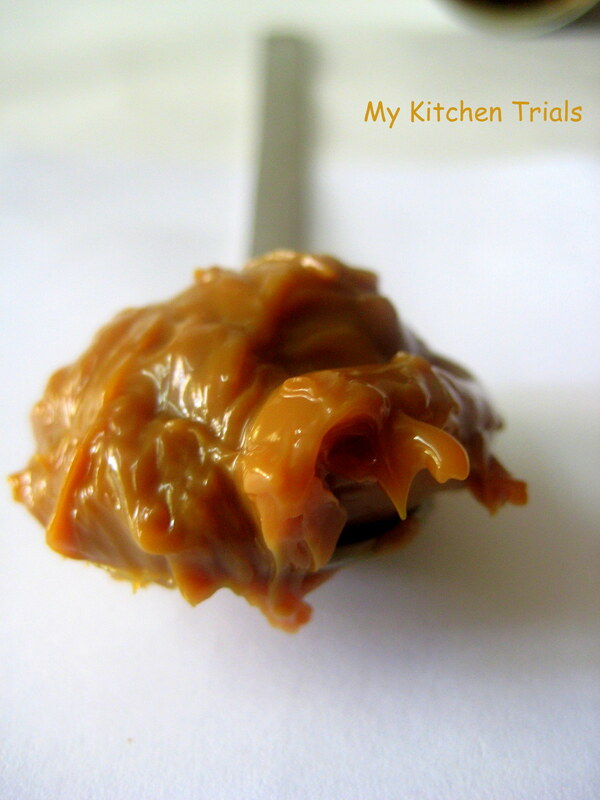 The first entry for the event is the sinfully tasty Dulce De Leche. This is something I am addicted to. All you need is a can of condensed milk and a pressure cooker. Its simple, easy and over in 30 minutes flat. Clean your pressure cooker and keep the condensed milk can inside. I make it lie down. Remove plastic cap or paper wrap, if any, from the can. I have a 5L cooker and I can cook two cans comfortably in it. Fill the cooker with water until the can is completely immersed in water. There should at least be 3″ of water above the can. Switch on the heat and wait for the first whistle. Lower the heat and cook in low heat for 20 -30 minutes after the first whistle. 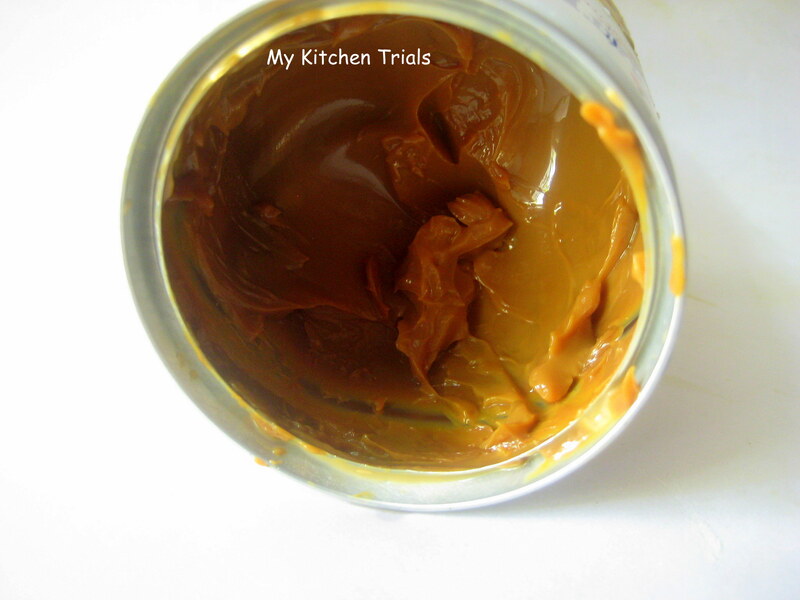 About 20 minutes on low heat (after the first whistle) will give you a not too thick Dulce De Leche, where as 30 minutes will give you one with thick consistency. Either way its yummy! Once the pressure drops, take out the can and let it cool completely before opening it. Note: I use pressure cooker in my everyday cooking. So I am quite used to it. If you are not familiar or comfortable using a cooker, then please don’t try this method. Don’t bother to find a recipe for using this, it will get over much before you get to that point. Check out here to see what other participating bloggers are cooking up! Looks very rich and sweet! Yum! 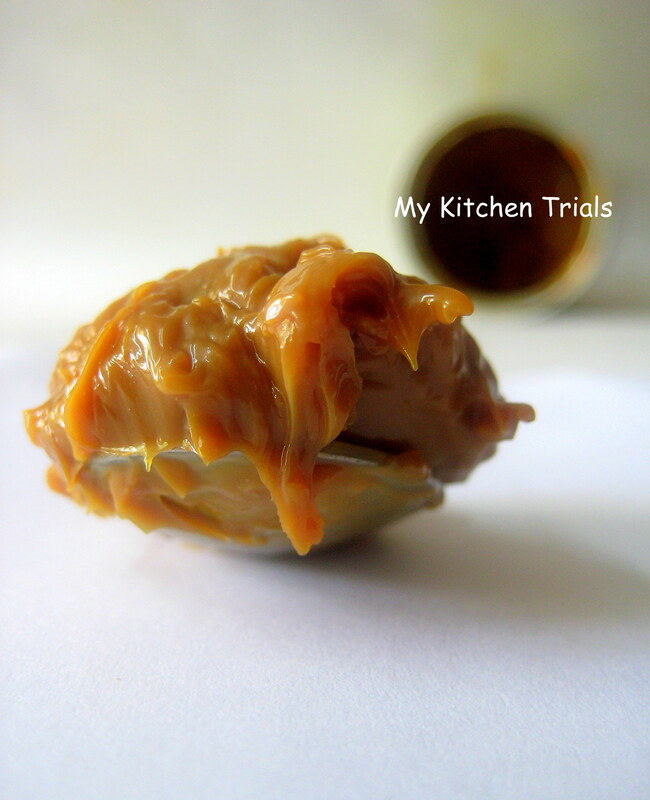 Omg, cant take my eyes from ur clicks, super prefect Dulce de leche.. whooooooops!!!!!! !This is a super duper sinful treat!!!!!!!!! !loving it…cant wait to get the condensed milk..absolutely stunning clicks!! Absolutely gorgeous clicks…Wow, you are so organized with the BM, unlike me. For most of the days during the BM, I cook on the day of posting. Wow looks yummy, what are the chances of hazards though? I am bit wary of using a closed can in a pressure cooker. or have I missed something? You have to ensure that the can is completely immersed in water. I use a 5L pressure cooker and have made this a couple of times without any problems. Now that’s really one detectable treat!..and trust me I don’t want to do this myself ok..diet and all, this surely is not advised to even look at..:))..good to have you join us for the BM! This post touches my heart because this is the last recipe that my grandma shared with me ( don’t cry she lived for another 11 years after sharing it, but she stopped cooking shortly after sharing it). She was so tickled to discover how easy it was that she called me and told me I had to make and see for myself. I can attest to how good it is and while my grandma thought it should be served with fruit, I prefer to eat it by the spoonful. :) Thank you for sharing this recipe with the Hearth and Soul Hop and letting me take a little trip down memory lane! this is awesome and very sinful!! So thick n luscious ! Oh man, that dulche de leche is making my mouth water.. so decadent and delicious. wow ! lovely dip to go with crackers or just my own fingers ;-) first time here Rajni and lovely to have you in the BM too ! New one and looks yummy. Nice pictures. Beautiful! And you have captured it very well! That is so singully delicious!!! It goes in unopened into the cooker. Don’t open the can until its cooked and completely cooled. I will add in the step wise pictures the next time I make it.